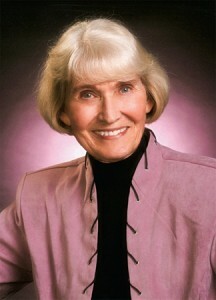 Cora Belle Nowotny Weight (BS ’50), a former BYU Emeriti Alumni Association president, has gone by a few names in her lifetime. Family and BYU friends call her Corky, though she often goes by Belle—the more dignified name befits her “advancing age,” she says. Or Corky Belle will do. In fact, she thinks it has a nice ring. And Weight can now add yet another appellation to her ever-growing list—Hall of Famer. Weight and her late husband, Joseph E. (Joe) Weight (BS ’49), were recently inducted into the Huntsman World Senior Games Hall of Fame at a ceremony in St. George, Utah. The honoring committee praised the Weights for the 15 years they spent as volunteers and pioneers at the games. It noted, “People like Joe and Corky are special not for what they do, but rather for who they are.” The Weights helped Daisy and John H. Morgan Jr. start the games in 1987 and were instrumental in the growth of the games from 500 to 2,000 athletes competing each year. Together, the Weights created and ran the senior games free-throw/three-point-shoot event. This was a perfect fit for Joe, who played and refereed basketball most of his life. A starter on the BYU men’s basketball team for three years, Joe was drafted by the Boston Celtics after graduation. And so does Weight, who still plays a competitive game of tennis. She lives on her ranch near Ramah, N.M. “I’m just enjoying my children and my grandchildren and the great Zuni Mountains,” Weight says.